This trip allows the travelers to enjoy the taste of the great variety of Bhutanese landscape, and the views from some of the major passes that we come across are breath taking, be it of mountains or the valleys underneath. It gives you a chance to meet people, enjoy the pristine forest with rare glimpse of wildlife and observe the ancient old traditions of arts and crafts. We would be traveling through the less frequented areas of Bhutan. Our journey starts from Paro Valley where our flight will land and continue by road through the lush valley of Thimphu the Capital city. After touring through this tiny town, we will take an excursion to the famous Tiger’s Nest locally known as Taktshang Gompa, this incredible monastery clings to the edge of a sheer rock cliff that plunges 900 meters into the valley below.We start our 8 days trek to Thimphu via Base camp of Mount. Chomolhari. 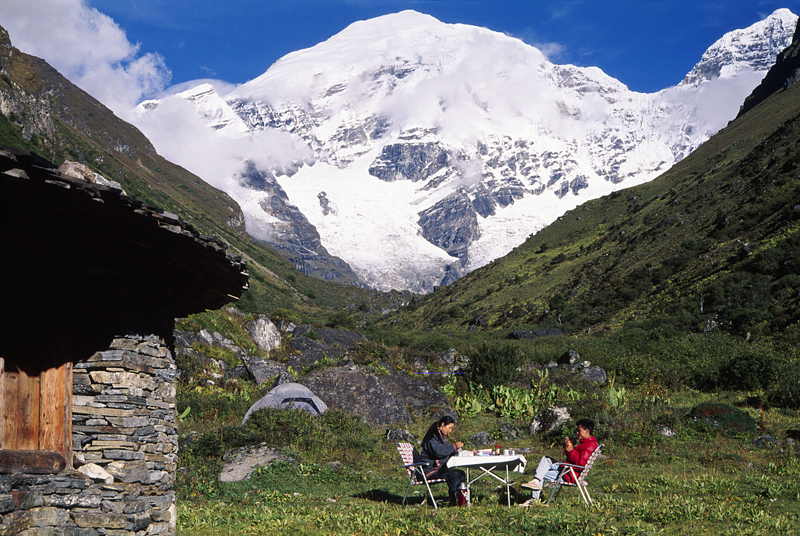 A medium duration trek that is probably the most trekked route in Bhutan due to its easy access, beautiful terrain and spectacular views of the majestic snowcapped mountains. Locally known as Chomolhari (The Mountain of Goddess Chomo), believed to be the abode of Chomo goddess is one of the most beautiful and imposing mountains in the entire Himalayan region. Located at the northwestern border with Tibet, the trek to the base camp of this dome shaped mountain provides an opportunity to experience the panoramic views of some of the world’s highest peaks. Beginning from Paro valley, your trek starts with gentle ascent through Bhutan’s undisturbed forest of rhododendrons and pines. Passing through the villages with lush fields of rice, wheat, barely and crossing over the tree lines you arrive in the regions sparsely inhabited by the migrant yak herders. The trail continues through enchanting valley flanked with snowcapped peaks to the base of Mount Chomolhari and its spike shaped companion, Jichu Drake. You spend one entire day exploring the vicinity or just relaxing and enjoying the wonders of nature. You resume your trek to the Thimphu valley by crossing two major passes through the remote wilderness with abundant of wildlife, including, blue sheep, Takin and variety of birds, perhaps under the surveillance of the elusive snow leopard. There will be ample of opportunities to interact with the friendly people of Bhutan and learn their philosophy of “GROSS NATIONAL HAPINESS”. After the trek, you have a day to see Bhutan’s tiny Capital city with no traffic light. Your guide who is going to be with you throughout your trip will meet you at the airport. A fifteen minute drive follows the narrow winding road to our hotel which is a traditional Bhutanese building with attractive gardens and an exceptionally peaceful atmosphere. In the afternoon, we will visit the Ta-Dzong which was built in 1651 as a watch tower for the Rinpung Dzong. Since 1967, the watch tower has served as the home of the National Museum and holds a fascinating collection of art, ancient relics and religious artifacts. Next in line is Rinpung Dzong built in 1646 by Shabdrung, the first spiritual and temporal ruler of Bhutan, the Dzong houses the monastic body of Paro and its district administration. If there is time, we will walk along the small main street of Paro in the evening with its typically Bhutanese shops and small lodges. Altitude at Paro – 2250 meters. Today’s sightseeing of Thimphu valley includes, visit to ; National Library, a treasure trove of priceless Buddhist manuscripts ; the Traditional Medicine Institute, where centuries old healing arts such as acupuncture and herbal remedies are still practiced; the Painting School, where young monks learn the art of Buddhist thangkhas, and the mask maker workshop. There are also workshop for fine metal craft, weaving, ceramics and paper making. Then, visit Handicrafts Emporium and local shops if you like to browse through examples of Bhutan’s fine traditional arts. Here you can buy textiles, thangkha paintings, masks, wood carvings, jewelries, and any other interesting items made from local materials.In the evening, we will take a drive to Paro which is about 2 hours. Tonight we will have a celebratory or farewell dinner.